A lifelong Malibu-ite, Shen Schulz’s intimate knowledge of the community and keen understanding of its housing market have earned him rave reviews from clients and the #1 sales spot for Sotheby’s Malibu this year. We asked Shen 10 questions to learn more about his career and life in Malibu. Have you always worked in real estate? If not, how did you get into the industry? I’ve been an entrepreneur since I was 15 years old. I founded Malibu’s Car Wash behind Taverna Tony’s, and when I was 25 started my own cleaning business. However following 9/11 the cleaning industry collapsed, and I needed to reinvent myself. In 2001 I began my real estate career, initially reaching out to clients from my cleaning business. I had already proven myself to them and earned their trust, and many of them gave me the opportunity to sell their homes. I’ve gone on to forge lifelong friendships with many of these first clients. You’re originally from Malibu and still live here. Do you think that gives you specific insight into the community that you’re able to pass along to your clients? Schulz with his sons, Kai and Bodhi. I grew up on Point Dume and in Malibu West. This history, coupled with my 18 years working in Malibu real estate, has provided me with an intimate understanding of and unique perspective on the city, and solidified my reputation as an expert in Malibu real estate. It’s important to know as much as possible about the community, from the schools and home values in each neighborhood to politics and building codes, and even the ocean currents or prevailing winds in popular beaches and coves. Being an area specialist gives me a unique ability to define the micro-climate details of Malibu, its culture and its neighborhoods to any home buyer or seller, and to protect my clients’ investment in their luxury property purchase or sale. What would you say are some of the reasons Malibu is such an in-demand place to live right now? Malibu sits close to L.A. but is a coastal suburb at heart, with unparalleled natural beauty that creates a very positive, healthy lifestyle. The public schools are some of the best in the nation and man people feel, as I do, the small town vibe is a great place to live and raise children outside of the bustle of Los Angeles, yet only an hour away from Downtown or LAX. What are some of your favorite things about both working in, and living in, the community? The people and friends are the best! Because of Malibu’s geographic separation from LA, locals often choose to stay in Malibu on weekend evenings and take in a sunset and the natural ambiance. This creates a collaborative and fun, small town feeling. Local bands at Vintage Grocers in the summer, hiking area trails, horseback riding, and surfers scattered along the coast all add to the beach-y, small town atmosphere. What would you say are the hottest areas to buy in Malibu right now? details to understand about each specific neighborhood; the homes values and attributes are often delineated by a curve in the road or rock outcropping along the beach. Statistically, the majority of homes sales in the past two years have been located in Malibu Park, Malibu West and on Point Dume, while the highest priced sales have been on Carbon Beach, the bluffs near Pepperdine and Encinal Bluffs. If you are considering moving to Malibu, it’s best to have an expert like me by your side, someone with an immense amount of experience transacting luxury estate properties and a deep appreciation of the community. There is too much to be aware of to go it alone. What are some of your favorite things to do in Malibu? 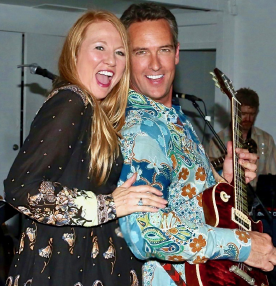 When not selling real estate I love playing music with my bands, The Roman Helmets and The Riptide Blues Band, and sharing a meal with family and friends, or surfing with my twin sons, Bodhi and Kai. We’ll often hit some of the same spots where I first learned to surf, like Zuma and Little Dume. My wife Ema also grew up in Malibu, and we love that we can raise our sons in the same fantastic family environment we did. You’re consistently ranked in the top 1/2% of all realtors among the Sotheby’s International Realty network. Can you characterize the key/keys to your success? Because of my extraordinary sales record and deep knowledge of Malibu real estate, I have become one of Malibu’s premier luxury Real Estate Brokers. I am the #1 Broker Associate with Sotheby’s International Realty in Malibu. One key to my success is my work ethic; I am up early in the morning and work 7 days a week. Even my vacations are filled with business. The second key to my success is my referral network. I spend a lot of time traveling to other states, visiting the top agents throughout the U.S. and sharing clients and referrals within our network. These relationships allow me to broadcast my luxury properties across the nation. If you hadn’t made your career in real estate, what do you think you would be doing? I love music but if I played professionally it might take the fun out of it. I might consider being a professional myth buster, Unicorn wrangler, sloth racing specialist, or in-house philosopher. Schulz and his wife, Ema, at the Sunset Restaurant. Is there a single sale or project in your career you’re most proud of? One thing I am honored by is being chosen by some of the original Malibu families to represent their estates. It’s an honor and privilege that my reputation has earned me their trust. Recently I sold the Malibu Playhouse, an iconic local theatre owned by an original Malibu family that was a valued community hub for nearly three decades. In the end the property received multiple offers and sold $200k above asking price to an undisclosed new owner who may choose to keep the legacy of the creative space for the community alive. It was a privilege to be part of such a positive transaction that may continue to benefit the entire community. You’ve worked as an agent for nearly two decades. What advice would you give someone who is just beginning their real estate career?